Use your stats to your advantage and inform your decision making on the course. Tailor your practice sessions based on where your weaknesses are. Read below to find out more about the statistic categories. Break down Approach Proximity, Green Success %, Shots to Finish, view by club, approach distance, lie type and many other variants. 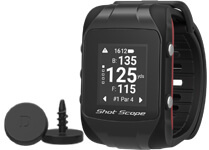 Shot Scope classifies any shot attempting to hit the green outside of 50 yards of the pin as an approach shot. PinCollect allows for highly accurate stats to be produced on: Average Short Game Proximity, % inside the ‘Red Zone’ (6ft) and that all important ‘Up & Down’ %. Shot Scope classes all shots within 50 yards of the pin as short game shots. View exactly where and how far each Tee Shot goes, as well as Fairway Hit %, Left and Right Miss and Scores based upon Tee Shot result. Get real Club Distances based upon the distance you hit shots on the course – not on the range. View Average, Performance Average, Longest and Usage for all of your clubs. PinCollect records the exact location of the pin to provide detailed statistics such as Putts per Round, Miss Long or Short, Hole out % from varying distances, Average Holes per 3-Putt and more. View your round on a map of the course and dive into each hole individually, to see each shot, score and hole averages. Automatically track every shot and analyze hole by hole or full round, on a map of the course. Knowing your club distances helps you to pick the right club to hit the green more often. Automatically track every shot mapped on an aerial view of the course for a bird’s eye overview. Use the Shot Scope social share feature to show off those good days on the course. Share on Facebook, Twitter or Instagram by clicking the share icon in the top right corner on 'round overview' page. Leaderboards provide users with a platform to compete against other Shot Scope users all over the world. Create your own private Leaderboards to compete directly amongst your friends. Unlock Medals for achievements during your round such as a Birdie, a Drive over 200 yards, playing 5 rounds in a week and hundreds more!